The distance from your vehicle to nearby obstacles when parallel parking or maneuvering into a garage is measured by the sensors and communicated via the multi-information display, touch screen and a buzzer. Always check the surrounding area when using this system. To turn the system on, press the switch. 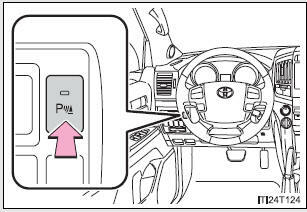 The indicator light comes on and the buzzer sounds to inform the driver that the system is operational. To turn the system off, press the switch again. The graphic is automatically displayed when an obstacle is detected. The screen can be set so that the graphic is not displayed. A simplified image is displayed on the touch screen when an obstacle is detected. 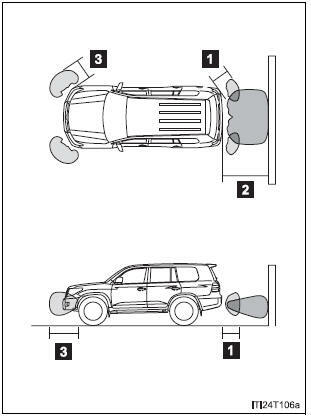 A beep sounds when the corner sensors and rear center sensors are operating. The buzzer beeps faster as the vehicle approaches an obstacle. When 2 or more obstacles are detected simultaneously, the beep system responds to the nearest obstacle. If one or both come within the above distances, the beep will repeat a long tone, followed by fast beeps. The diagram shows the detection range of the sensors. Note that the sensors cannot detect obstacles that are extremely close to the vehicle. The range of the sensors may change depending on the shape of the object etc. You can change the warning beep volume and touch screen operating conditions. Touch “Vehicle” on the “Setup” screen. 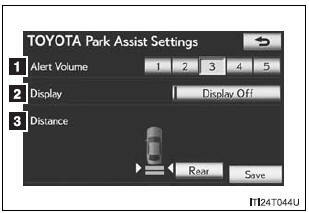 Touch “Toyota Park Assist” on the “Vehicle Settings” screen. Make sure to save after changing settings. The alert volume can be adjusted. Touch “1” to “5” on the “TOYOTA Park Assist settings”. On or off can be selected for intuitive parking assist display. When the “Display Off” indicator is turned on, the display of intuitive parking assist will be off. 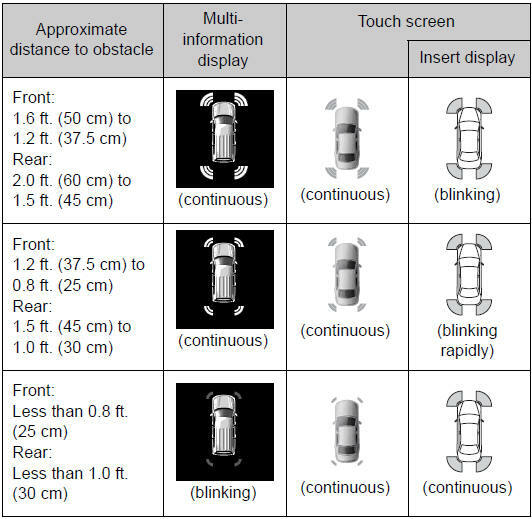 Touch “Display Off” again to turn the display of intuitive parking assist on. Front or rear center sensors display and tone indication can be set. Long distance or short distance can be selected. The shift lever is in a position other than “P”. The vehicle speed is less than approximately 6 mph (10 km/h). The shift lever is in “R”. 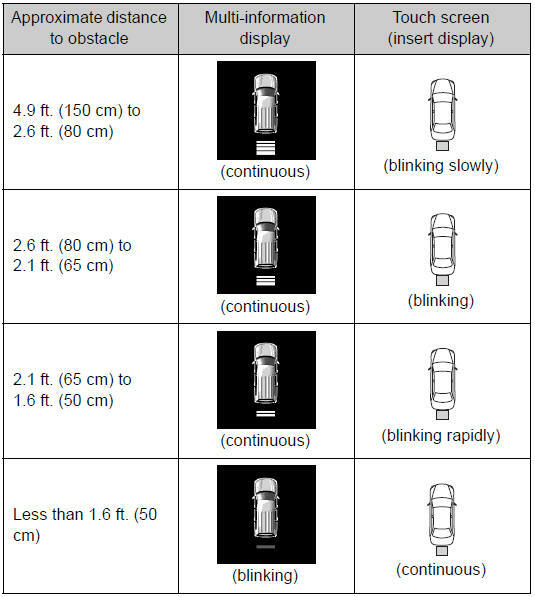 When an obstacle is detected while the rear view monitor system, Toyota parking assist monitor or Multi-terrain Monitor is in use, the warning indicator will appear in the top right of the screen even if the display setting has been set to off. The sensor’s detection areas are limited to the areas around the vehicle’s front corner and rear bumpers. Certain vehicle conditions and the surrounding environment may affect the ability of the sensor to correctly detect obstacles. Particular instances where this may occur are listed below. The sensor is frozen. (Thawing the area will resolve this problem.) In especially cold weather, if a sensor is frozen the screen may show an abnormal display, or obstacles may not be detected. The sensor is covered in any way. The vehicle is leaning considerably to one side. The vicinity of the vehicle is noisy due to vehicle horns, motorcycle engines, air brakes of large vehicles, or other loud noises producing ultrasonic waves. There is another vehicle equipped with parking assist sensors in the vicinity. The sensor is coated with a sheet of spray or heavy rain. The vehicle is equipped with a fender pole or wireless antenna. The bumper or sensor receives a strong impact. The vehicle is approaching a tall or curved curb. The area directly under the bumpers is not detected. If obstacles draw too close to the sensor. A non-genuine Toyota suspension (lowered suspension etc.) is installed. People may not be detected if they are wearing certain types of clothing. In addition to the examples above, there are instances in which, because of their shape, signs and other objects may be judged by the sensor to be closer than they are. The following situations may occur during use. Depending on the shape of the obstacle and other factors, the detection distance may shorten, or detection may be impossible. There will be a short delay between obstacle detection and display. Even at slow speeds, there is a possibility that the obstacle will come within the sensor’s detection areas before the display is shown and the warning beep sounds. Thin posts or objects lower than the sensor may not be detected for collision when approached, even if they have been detected once. It might be difficult to hear beeps due to the volume of audio system or air flow noise of air conditioning system. Failing to do so may result in the vehicle being unable to be driven safely and possibly cause an accident. Do not use the sensor at speeds in excess of 6 mph (10 km/h). The sensors’ detection areas and reaction times are limited. 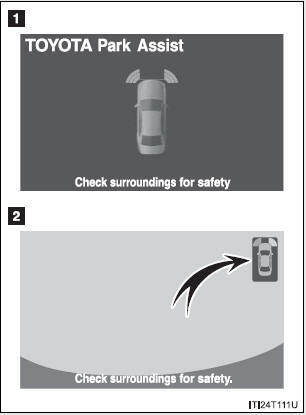 When moving forward or reversing, check the areas surrounding the vehicle (especially the sides of the vehicle) for safety, and drive slowly, using the brake to control the vehicle’s speed. Do not install accessories within the sensors’ detection areas. In the following situations, the system may not function correctly due to a sensor malfunction etc. Have the vehicle checked by your Toyota dealer. A beep does not sound when you turn the main switch on. 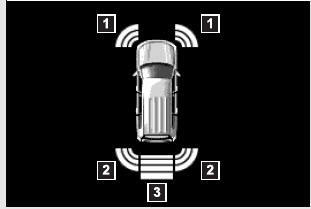 The intuitive parking assist operation display flashes, and a beep sounds when no obstacles are detected. If the area around a sensor collides with something, or is subjected to strong impact. If the bumper collides with something. If the display shows continuously without a beep. If a display error occurs, first check the sensor. If the error occurs even if there is no ice, snow or mud on the sensor, it is likely that the sensor is malfunctioning. Do not apply intensive bursts of water or steam to the sensor area. Doing so may result in the sensor malfunctioning.